Several hundred friends and members of Brooklyn For Peace, Brooklyn's largest and most active peace and justice organization, crowded into the historic Plymouth Church in Brooklyn Heights. They were there to celebrate the organization's more than 30 years in fighting the good fight. But also to honor this year's Pathmakers To Peace, wherein those individuals who have led the fight for peace, equality and social and economic justice. • Moustafa Bayoumi, for his work addressing the impact of “War on Terror” on the Muslim-American community and on civil liberties. He is an English professor at Brooklyn College. • Frances Fox Piven, for her work as a social theorist and welfare rights activist, particularly addressing issues of income inequality and political participation. She is a political science professor at the Graduate Center, City University of New York (CUNY). • Opal Tometi, for her inspiration as a co-founder of Black Lives Matter. She is currently Executive Director of the Black Alliance for Just Immigration. • Granny Peace Brigade, for their role model of sustaining hope with activism in demonstrations opposing war, the violence of poverty and racism, and standing for human rights and justice globally and locally. The affair was catered by Bassett's who provided a wonderful array of appetizers and then a sumptuous buffet as well as plentiful desserts. Wine and spirits rounded out the evening's gastronomic festivities. The evening was moderated by Brooklyn For Peace Vice-Chair, Veronica Nunn, who also introduced two of the honorees. As for the speakers, the addressed the enormous problems confronting progressives with the results of the recent election installing a reactionary bunch of extremists who are now in control of all three branches of the Federal government. Brooklyn Vice-Chairs David Tykulsker and Carolyn "Rusti" Eisenberg pointed out the dangers of the moment. The honorees called for a broad unity of forces to lead the fightback and resistance to actions taken by Trump and the GOP Congress yet to come. They all resolved not to give in to despair but to increase their activism to meet the challenges ahead. The audience responded with cheers and applause, signalling their agreement to push on and win the battle, agreeing that it will be difficult and a long one but one that requires a fighting posture. Please enjoy our photos of this uplifting and memorable event. 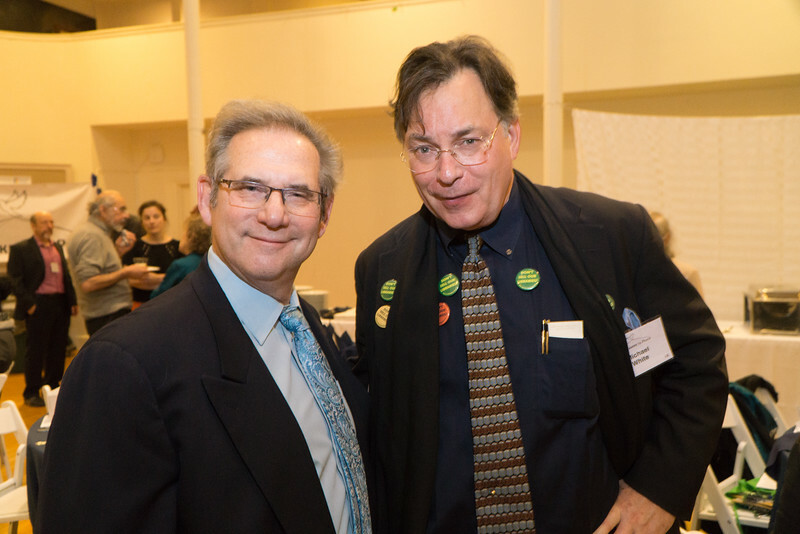 Dr. Warren Spielberg and leader of the fight against closure of libraries, Michael DD White.